Beautiful Incentives: Get #vintage chic with Holy Clothing! Get #vintage chic with Holy Clothing! I stumbled across a new clothing site through a friend and I was so excited with what I saw. Holy Clothing carries the most unique vintage inspired styles from all the way back to the 1800's until now. I am a huge fan of looks from different periods and love to dress modern, with a vintage twist. It is so rare that I find clothing that fuses these styles into how we dress today, so one look at their clothing and I was in love. Not only do they carry such gorgeous pieces, but they go all the way up to size 5x! Say goodbye to being too much woman for your favorite clothing stores! You will adore this line. The materials are crafted in India and the clothing is made to order. Let me be the first to say that this clothing is quality and cared for very well. Each stitch is well made and the decorative features of everything are outstandingly ornate. How do I know they took so much care in my order? Customer service promptly alerted me that there was an issue with my piece and another one would be made soon. That didn't take more than a day! I initially ordered a skirt, but there was a dye process issue. I appreciated that they kept me in the know about everything and that they bothered to care, unlike most companies. I found myself having to return the skirt and wanting the shirt more. It was a breeze and the exchange was shipped fast. The skirt was beautifully made, but I just didn't like how full it was on me. The shirt though, I am in love with. 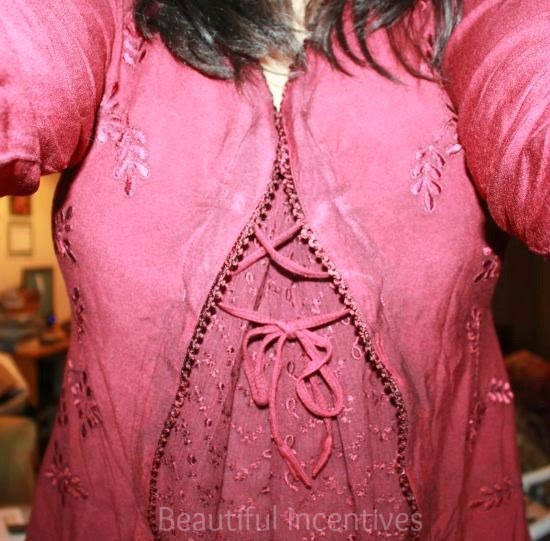 The shirt that I received for review is called the Monique Classic Gypsy Chic Embroidery Boho Blouse and I chose the beautiful Burgundy Wine color. This top exceeded my expectations in person. The color is rich and vibrant and the detail is just utterly gorgeous, as stated above. I couldn't be happier with the fit. It hugs me like it was meant for my body alone. I love the added bonus of the tie in the back. 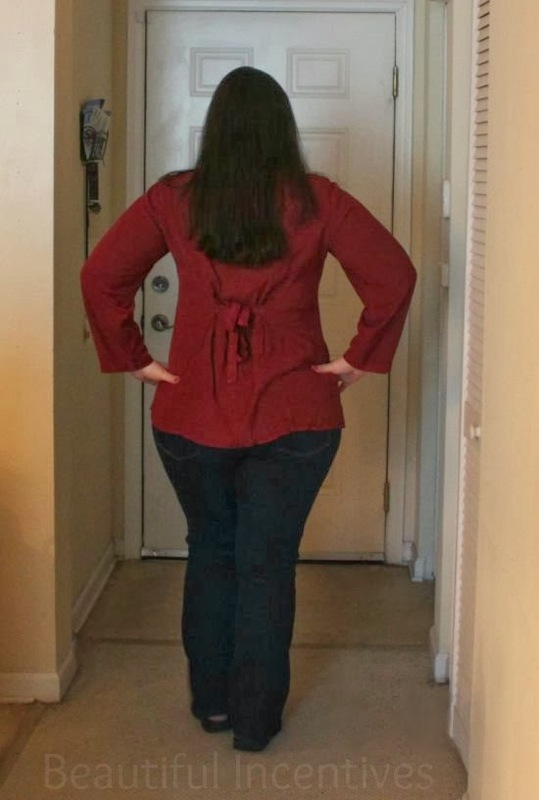 I think almost all shirts should have this feature, simply because I am plus size, but my waist is my best attribute. 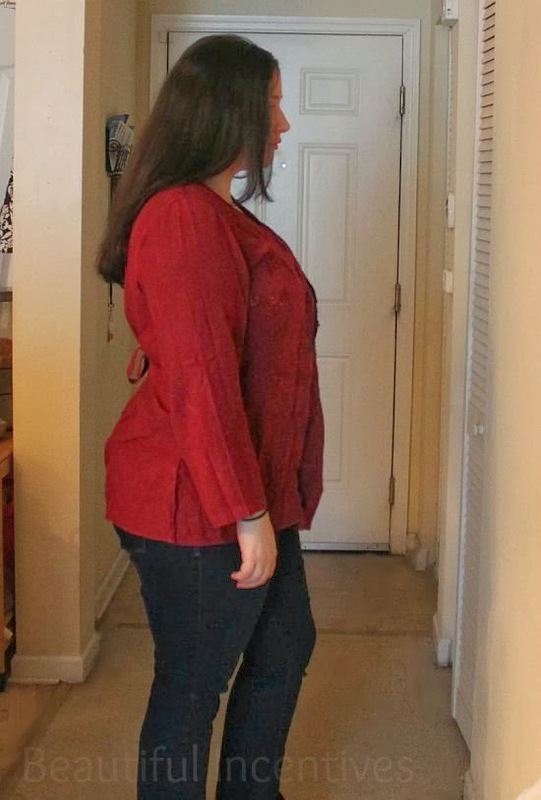 When it's less baggy around that area, I don't look as heavy. It is also full enough that I can hide my belly and it just flows so well with me. I always have a problem with getting sleeves to fit properly as well and these were perfect. Not too tight and not too big. 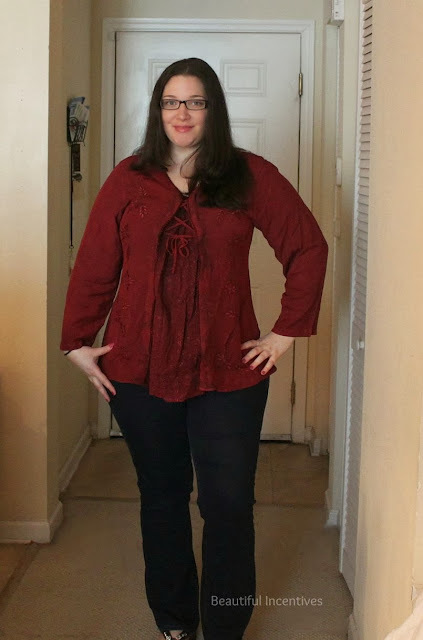 For those of you with more of a tummy, there is plenty of room in the midsection to disguise that, but at the same time like I said, it accentuates what you want. The comfort of this top is off the charts. It's so soft and silky. I am proudly including Holy Clothing in my Gift Guide. It has gone beyond the mark for quality. If you are in love with this top, you have to see the many other beautiful pieces they offer. They have skirts, dresses, tops in every style imaginable! You will be astounded by the styles and colors. If you buy one now, make SURE to sign up for their newsletter for $5 off your first purchase and they ALWAYS hold giveaways on their Facebook. This top is only $29.99 with that discount! Men & women, listen up! If your lady, friend or SO love the vintage look, you have to get them something or a gift card. I know that I would be so excited to have a gift like this waiting for me!